The club is open to all those interested in the Bedford CF and Opel Blitz produced between 1969 and 1987 by Vauxhall Motors Ltd. as the 97000 series van and variants and also the Holden versions that have many similarities in design. There isn't even any need own a CF; just keeping in touch with how the Bedford CF continues to survive can be enough reason to join the club and all are welcome whatever their interest. 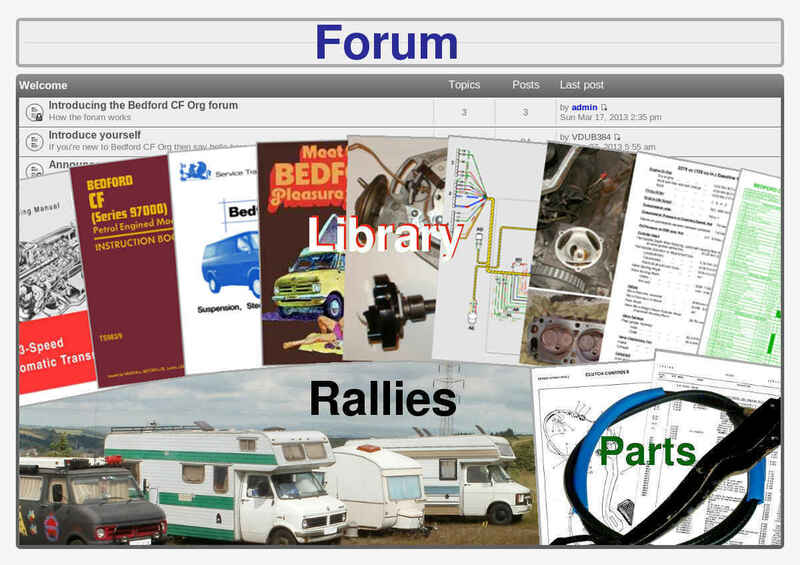 For those who do own a Bedford CF the club has a wealth of technical and other information to browse and, for Subscribing Members, request as PDF documents and other formats at no cost. Subscribing Members also have unlimited access to the club Parts Department where they can obtain assistance in finding parts as well as purchase Bedford CF parts held in stock by the club. Meanwhile there's a lot for free available anyway so if you're in a hurry for answers then the forum is where to go first.